Often, sleep disorders arise due to complications with breathing. When factors cause children to have trouble breathing freely during the night, they often end up receiving poor and frequently interrupted sleep. In order to help little ones in Livonia, MI, we may suggest custom-made orthotropic appliances. How do these devices help treat common sleep troubles, and prevent further problems down the road? For some children, issues with the growth and formation of oral structures, such as the jaw or tonsils, may obstruct air passages when they lay down to sleep. In the present, this means difficulty obtaining the deep, uninterrupted sleep needed to stay alert during the day. Children also become moody and may be prone to emotional outbursts and tantrums. 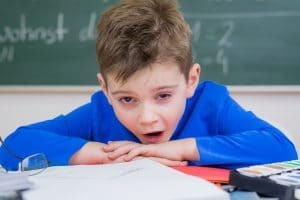 School performance suffers and children with sleep disorders may end up misdiagnosed with ADD or ADHD. As they grow older, these issues persist and the risk of sleep apnea increases. The same issues linked to breathing obstruction may also lead to misalignment and problems with facial structure. If your child seems tired during the day, has trouble staying awake, experiences fitful and interrupted sleep, and lags behind in school you may consider a diagnosis from our office. If we find breathing obstruction is occurring, we may suggest an orthotropic appliance to open air passages. The device is a custom-made appliance worn at night. The appliance actually fits like a mouthguard and helps adjust the jaw to keep airways open. As your little one grows, the appliance also guides the growth of the oral structures and jaw, improving facial structure, reducing the risk of misalignment, and limiting the chances of sleep apnea in the teen and adult years. Each device will be custom-made to ensure a comfortable fit and accurate treatment. Does Your Little One Need Treatment? If you believe your child may benefit from treatment, then visit our website and take our Child Sleep Health Questionnaire. By answering a series of simple questions about your child’s sleep habits, we help assess their risk. We will also provide a detailed examination in our office. From there, we can move forward with the creation of a custom-made oral appliance and also discuss changes to your child’s nighttime habits to help encourage better rest. If you have any questions about our approach to orthotropic treatment, then contact our team today. We want to help your child enjoy improved quality of life! Do You Have Questions About Sleep Disorders? We have options to help your children enjoy better sleep. James Stewart, DDS, and our team serve patients from Northville, Novi, Dearborn Heights, MI and the surrounding communities. To schedule a consultation, call our office today at (734) 425-4400.